Hello, Hello and welcome to #LoveNorthEast for April. 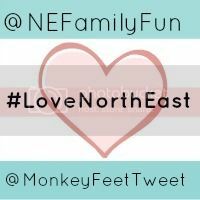 This is the place to link up, discover and promote North East blog posts and should about all of the things we love about the North East. My featured post from last month's linky is Papercuts Craft Shop by Northeast Crafty Blogger. It was nice to read about some of the alternative events going on here in the North East and I love how much Papercuts has to offer.